We read in Chapter 20 that the city had come down before the wicked were resurrected, and once the wicked are resurrected Satan convinces them to attack it, but they are destroyed in the “lake of fire.” I believe Elohim has chosen to place the New Jerusalem coming to the earth, which is mentioned in this chapter, with the more pleasant scenes pictured in Revelation 21. Once sin and sinners are destroyed along with all the “debris” that has accumulated from the six thousand years of this earth’s history, I believe Elohim will restore this earth to what it was like when it was first created and maybe even more beautiful than it was when it was first created. The root word of salvation is salvage. That is what Elohim will have done with the redeemed of this earth; He will have restored the wrecks of humanity into His Own likeness. He is not only the Creator but is also the Re-Creator! And now we have pictured for us the re-creation of the earth into a most glorious place to inhabit for all eternity. Elohim will have fixed all that had been affected by sin. “Blessed are the meek: for they shall inherit the earth” (Matthew 5:5). Earth is to be our eternal home. “For thus saith Yahuwah that created the heavens; Elohim Himself that formed the earth and made it; He hath established it, He created it not in vain, He formed it to be inhabited: I am Yahuwah; and there is none else” (Isaiah 45:18). Even greater still is the fact that Elohim and His only begotten Son will live on this earth with us throughout eternity after the thousand-year stay in what is now heaven. “And I heard a great voice out of heaven saying, Behold, the tabernacle of Elohim is with men, and He will dwell with them, and they shall be His people, and Elohim Himself shall be with them, and be their Elohim” (Revelation 21:3, emphasis added). We see the joy of adopted children who have been separated from their biological parents when they are reunited with their parents once again, and we can only imagine what it will be like when we meet our Creator, our heavenly Father, face-to-face for the first time. The joy of the parents of those separated children is pretty intense also, as will be the joy of our Heavenly Father when we are united with Him for all eternity. We, who have had to live apart from the visible presence of our Creator for six thousand years, will never be separated from Him again. “Whom having not seen, ye love; in Whom, though now ye see Him not, yet believing, ye rejoice with joy unspeakable and full of glory” (1 Peter 1:8). O how hard it is to be separated from someone you dearly love! How hard it is to be separated from the One you love Who you have not even seen! Heaven will be moved to this earth, and we will never ever be alone again! Our Father will always be here with us along with His only begotten Son, our Savior, and the heavenly angels who have been our invisible companions and protectors as we have lived our lives on the earth! Oh, to hear the stories they will have to tell us while they watched over us during our lifetime. Only in our imaginations can we picture the scenes before us. Words are inadequate to picture it fully, but John is told to “write: for these words are true and faithful” (Revelation 21:5). They are like seeds planted in our minds to contemplate and expand upon. The new earth will be our home throughout eternity. The earth, made new without tears, death, sorrow, crying, disease, sickness, fear and pain that have made this life less than what Elohim had intended for His children, is to be restored to what Elohim had originally intended for mankind in the first place! “These all died in faith, not having received the promises, but having seen them afar off, and were persuaded of them, and embraced them, and confessed that they were strangers and pilgrims on the earth. For they that say such things declare plainly that they seek a country” (Hebrews 11:13-14, emphasis added). We are but pilgrims here; heaven is our home and eventually the earth made new! We will contemplate with unending delight the wonders of Creation, the mysteries of redeeming love, the companionship of heavenly beings, and the privilege of visiting worlds afar (space travel). We will meet those loved ones who have fallen asleep before us; those heroes and heroines of the past. We will be restored physically, mentally, emotionally and spiritually and sit at the feet of our Savior and gaze into His face beaming with unutterable love for the objects of His sacrifice and to be with the One who made that infinite sacrifice for us in the giving of His Son to humanity. That sacrifice is best described in Isaiah 53. We will never be limited again by time or space. As the song goes, “When by His grace, I shall look on His face, that will be glory, be glory for me.” When Yahushua looks upon the redeemed “He shall see of the travail of His soul [The intense mental and physical pain He endured. ], and shall be satisfied” (Isaiah 53:11). Many read 1 Corinthians 2:9 and never go on to verse 10 for the complete thought, so let us look at those two verses. “But it is written, Eye hath not seen, nor ear heard, neither have entered into the heart of man, the things which Elohim hath prepared for them that love Him. But Elohim hath revealed them unto us by His Spirit: for the Spirit searches all things, yea, the deep things of Elohim” (emphasis added). Elohim gave other portions of Scripture to other prophets that give us some idea of what the new earth will be like and what we will be doing throughout eternity. “And they shall build houses, and inhabit them; and they shall plant vineyards, and eat the fruit of them. They shall not build, and another inhabit; they shall not plant, and another eat” (Isaiah 65:21-22). “And it shall come to pass, that from one new moon to another, and from one Sabbath to another, shall all flesh come to worship before Me, saith Yahuwah” (Isaiah 66:23). You may have been visiting some far off galaxy, but you will return to worship Elohim at the times He has set apart for you to be with Him. “But the meek shall inherit the earth; and shall delight themselves in the abundance of peace” (Psalm 37:11). This renewed earth will be a very beautiful place to dwell in forever. As I write this book, I think about what a lovely place Elohim has placed my wife and me. We live amid the hills and hollers of Greene County, Indiana with woods, hills, streams, creeks, meadows, and wildlife. It is so peaceful and beautiful, but it is not our home. The earth made new and free from sin and its effects on creation and mankind has been promised to us if we are faithful. “But they that wait upon Yahuwah shall renew their strength; they shall mount up with wings as eagles; they shall run and not be weary; and they shall walk, and not faint” (Isaiah 40:31, emphasis added). When you get old, it does not take running to be weary! I believe we will be able to fly as the eagle because we will be given wings. Yahushua said “For in the resurrection they neither marry, nor are given in marriage, but are as the angels of Elohim in heaven” (Matthew 22:30), and I believe that the angels have wings. Read the verse carefully and prayerfully and see what you think? If we are to take the Bible literally, it certainly seems like this verse is saying we will be given wings to fly like the eagle. The thing man has always dreamed about will become reality! “And He said unto me, It is done. I am Alpha and Omega, the beginning and the end. I will give unto him that is athirst of the fountain of the water of life freely. He that overcomes shall inherit all things; and I will be his Elohim, and he shall be My son” (Revelation 21:6-7, emphasis added). This is the third time we find the words “It is done” in reference to the plan of salvation. The first time was at the cross when Yahushua cried out “It is finished;” which also could have been translated “it is done.” The sacrifice for the salvation of mankind was completed at that time. The second time we saw in Revelation 16:17 when the seventh plague was poured out. We saw how the probation of mankind had come to an end at that time when it was declared “it is done.” And now the third and final time when those words “it is done” are spoken by Elohim Himself indicating everything for the restoration of mankind, the earth and the Universe has been completed. Elohim has made “all things new” (Revelation 21:5). Sin will never ever enter the Universe again. Praise Yahuwah; HalleluYah! What will it mean to be considered a son or daughter of the Creator? What do we inherit? We, who have been enemies of Yahuwah and at some point in our lives have been reconciled to Elohim, have been “born again,” have been adopted into the family of Elohim, will have all the privileges and opportunities of the sons and daughters of the Almighty Eternal Yahuwah Elohim. Yahushua, Who is our elder Brother, told Mary after He was resurrected, “I ascend unto My Father, and your Father; and to My Elohim and your Elohim” (John 20:17). Yahuwah Elohim is the Father of Yahushua and those of us whom He has adopted when He gave to each of us His Spirit to live within us (John 14:17). There is an actual “fountain of the water of life” from which we will drink, and our thirst will be quenched. Today, most of the water of earth is not fit to be drunk unless it is purified, but in the earth made new, we will be able to drink freely “of the water of life.” No pollution! No contamination! No comparison! “He that overcomes shall inherit all things” (Revelation 21:7, emphasis added). Nothing is promised to the sinner. It is in this life that we are to overcome sin; no promise is made to those who continue sinning. Read these words of promise in Revelation: “To him that overcomes will I give to eat of the tree of life, which is in the midst of the paradise of Elohim” (Revelation 2:7). “He that overcomes shall not be hurt of the second death” (Revelation 2:11). “To him that overcomes will I give to eat of the hidden manna, and will give him a white stone, and in the stone a new name written, which no man knows saving he that receives it” (Revelation 2:17). This name is known only to you and Elohim. “And he that overcomes, and keeps My works unto the end, to him will I give power over the nations . . . and I will give him the morning star” (Revelation 2:26, 28). “Morning star” was Lucifer’s name while he was still a loyal angel to Elohim. “He that overcomes, the same shall be clothed in white raiment; and I will not blot out his name out of the book of life, but I will confess his name before My Father, and before His angels” (Revelation 3: 5). This promise is especially precious to those living at the end of time who need to be clothed in the “righteousness of the saints” in order to be ready for the marriage supper of the Lamb (Revelation 19:7-8). “Him that overcomes will I make a pillar in the temple of My Elohim, and he shall go no more out; and I will write upon him the name of My Elohim (Yahuwah), and the name of the city of My Elohim, which is new Jerusalem, which cometh down out of heaven from My Elohim: and I will write upon him My new name” (Revelation 3:12, 19:12), and those names will be written in their foreheads as we are told in Revelation 14:1. Many will have refused the name or number of the beast and shall wear the name of Yahuwah and the new name of His Son in their foreheads throughout eternity as a testimony to their faithfulness. “To him that overcomes will I grant to sit with Me in My throne, even as I also overcame, and am sat down with My Father in His throne” (Revelation 3:21). Yahushua overcame just as you and I must through the strength and power given to Him by His Father while on this earth through the indwelling presence of the Spirit of Elohim. That same grace (power) is available to us for the asking: “Ask, and it shall be given you” (Matthew 7:7). “If you being evil know how to give good gifts unto your children: how much more shall your heavenly Father give the Holy Spirit to them that ask Him” (Luke 11:13). Nothing is promised to him that continues in sin but the second death. Jude 24 states a most precious promise of Elohim: “Now unto Him that is able to keep you from falling [sinning], and to present you faultless before the presence of His glory with exceeding joy.” It is Elohim that keeps us from sinning by giving us His Spirit to dwell within us. The power that was available to His Son, Yahushua, is available to each of us. “But the fearful, and unbelieving, and the abominable, and murderers, and whoremongers, and sorcerers, and idolaters, and all liars, shall have their part in the lake which burns with fire and brimstone: which is the second death” (Revelation 21:8). The “fearful and unbelieving” are placed with the open sinners and share their fate. How does one become unafraid and believing? At one time, I was “fearful and unbelieving,” but as I became acquainted with Elohim and His love and power, fear and unbelief left me. “Acquaint now thyself with Him [Elohim], and be at peace” (Job 22:21). As we become acquainted with Yahuwah and His character and power, we find peace of mind. Yahushua said, “Peace I leave with you, My peace I give unto you: not as the world gives, give I unto you. Let not your heart be troubled, neither let it be afraid” (John 14:27). We never believe in people that we do not know personally. The better we know someone, and they prove themselves honest and true, we can then put our confidence in them. Faith in people takes time and so it does with Yahuwah. “Elohim is love” (1 John 4:8). “There is no fear in love; but perfect love casts out fear” (1 John 4:18). When a mile-wide tornado was tearing my house apart above me, perfect peace came to me when the words of Psalm 56:3 came into my mind and Elohim’s presence flooded my entire being. “What time I am afraid, I will trust in Thee.” Yahuwah will give us perfect peace as we daily sit as His feet and learn of Him, who “only is my rock and my salvation; He is my defense; I shall not be greatly moved” (Psalm 63:2). In times of trouble we experience the truth of His word, if we have taken the time to “acquaint” ourselves with our Elohim during times of peace, and the best way to acquaint ourselves with Elohim is by taking time to read the four gospels which reveal to us what Elohim is like through His Son. “Thomas said unto Him, Master, we know not whither Thou goest; how can we know the way? Yahushua said unto him, I am the way, the truth, and the life: no man comes to the Father but by Me. If you had known Me, you should have known the Father also: and from henceforth you know Him, and have seen Him. Philip said unto Him, Master, show us the Father, and it sufficeth us. Yahushua said unto him, Have I been so long time with you, and yet hast thou not known Me, Philip? He that hath seen Me hath seen the Father; and how sayest thou then, Show us the Father?” (John 14:5-9). The Father, our Creator, Elohim, is just like His Son. There is absolutely no excuse that can be given to be “fearful and unbelieving.” “I can do all things through Messiah which strengthens me” (Philippians 4:13, emphasis added). “And there came unto me one of the seven angels which had the seven vials full of the seven last plagues, and talked with me, saying, Come, hither, I will show thee the bride, the Lamb’s wife. And he carried me away in the spirit to a great and high mountain, and showed me the great city, the holy Jerusalem, descending out of heaven from Elohim, having the glory of Elohim: and her light was like unto a stone most precious, even like a jasper stone, clear as crystal” (Revelation 21:9-11, emphasis added). The bride is the New Jerusalem, and we are the guests as shown in the parable that Yahushua told us in Matthew 22:1-14. There is no crime or violence or homelessness in this city. Verses 12 through 21 describe the New Jerusalem, the bride, the Lamb’s wife. The city’s walls are approximately 216 feet high and have three gates, each gate being a single pearl, on each of the four sides – twelve in all. From what I have been told, the colors of the stones of the wall in the order they are given are those of the rainbow, and the streets of the city are pure gold that look like glass. Imagine walking on streets of pure gold. What men have all their lifetimes sought and fought for will be the substance streets are made of. The city is huge; to the best of my understanding, it is 375 miles wide, 375 miles long, and 375 miles high. Yahuwah has been renovating mansions for the redeemed (John 14:3). The former occupants were the angels who were cast out of heaven six thousand years ago. The homes built by the redeemed (Isaiah 65:21-22) are their country estates. “And the city had no need of the sun, neither of the moon, to shine in it: for the glory of Elohim did lighten it, and the Lamb is the light thereof” (Revelation 21:23). Throughout the Bible, “light” is associated with Elohim. “This is the message that we have heard of Him, and declare unto you, that Elohim is light, and in Him is no darkness at all” (1 John 1:5). “Every good gift and every perfect gift is from above, and cometh down from the Father of lights, with Whom is no variableness, neither shadow of turning” (James 1:17). There is nothing dark or hidden or shadowy with Elohim. Everything He does is done openly and in the light of day, and not in the darkness. Total transparency! When Yahushua was being questioned before the High Priest, we read, “The high priest then asked Yahushua of His disciples, and of His doctrine. Yahushua answered him, I spoke openly to the world; I ever taught in the synagogue and in the temple, whither the Jews always resort; and in secret I said nothing” (John 18:19-20, emphasis added). Complete transparency! All of this world’s secret societies with their secret conspiracies will come to light before Yahushua returns. Yahushua hid nothing from mankind in His efforts to win us back to loyalty to His Father. Such transparency will be seen in the city of Elohim. Even the streets which are made of gold are transparent. “The street of the city was pure gold, as it were transparent glass” (Revelation 21:21, emphasis added). Yahushua could not get caught in a lie because there was none. In His mouth was no guile (deceit) (1 Peter 2:22)! “And the nations of them which are saved shall walk in the light of it: and the kings of the earth do bring their glory and honor into it. And the gates of it shall not be shut at all by day: for there shall be no night there. And they shall bring the glory and honor of the nations into it. And there shall in no wise enter into it anything that defiles, neither whatsoever works abomination, or makes a lie: but they which are written in the Lamb’s book of life” (Revelation 21:24-27) shall dwell there. Eternal security and safety! Even though there is no need of the sun in the New Jerusalem, Isaiah 30:26 tells us, “Moreover the light of the moon shall be as the light of the sun, and the light of the sun shall be sevenfold, as the light of seven days, in the day that Yahuwah binds up the breach of His people, and heals the stroke of their wound.” Outside the New Jerusalem it appears there will be night and day. Not only is the earth made new, but the heavens will be made new also. “And I saw a new heaven and a new earth: for the first heaven and the first earth were passed away” (Revelation 21:1). Does the entire Universe get realigned? Someday we will find out. When Elohim originally created the earth, He “made two great lights; the greater to rule the day, and the lesser light to rule the night” (Genesis 1:16). He did not make just a single light; He created two lights. And when He recreates this earth, the moon will once again shine forth and the sun will be seven times brighter than it is today. Evidence brought back from the moon shows that at some time in the past it was on fire because the rocks are igneous. We know that from what is written in Isaiah 66:23 that “it shall come to pass, that from one new moon to another, and from one Sabbath to another, shall all flesh come to worship before Me, saith Yahushua.” The moon, originally placed in the heavens to mark the “seasons” of worship, will continue to function in the earth made new as Elohim designed it to do in the beginning (Genesis 1:14, Psalm 104:19). It is my prayer that each one reading this book will have their name written in the Lamb’s Book of Life, and that one day we will meet in that beautiful city of Elohim as we gather around the throne of Yahuwah and the Lamb! 1. Will there be a Temple in the earth made new? 2. Will there be any more death, sorrow, or crying in the earth made new? 3. 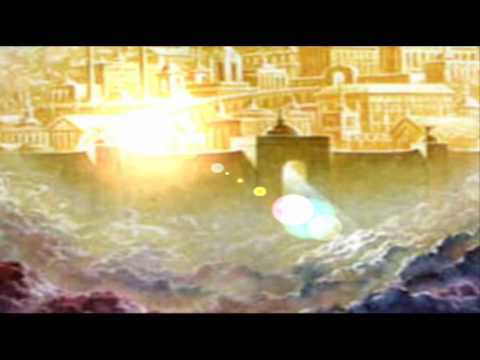 What are the streets of the New Jerusalem made of?